Now supplied with version 2 firmware we present the second incarnation of our essential equipment for the sound and audio installation engineer. The dBbox2 allows monitoring, metering and generation of analogue, AES/EBU and SPDIF audio from a pocket sized box. The dBbox2 includes a simple five key menu interface to make any test as simple as possible. The case has been formed using our own purpose designed aluminium extrusion then machined and painted to give the unit it's very individual look. Monitor mono or stereo line level analogue inputs using the built in speaker or 1/4 inch or 3.5mm headphones. Meter using either PPM or VU scale also with stereo phase meter. Monitor microphone level analogue inputs, with or without 48v phantom power, using the built in speaker or headphones. Meter using either PPM or VU meter scale with stereo phase meter. 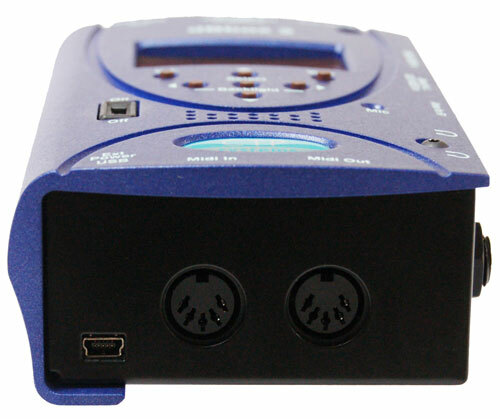 Monitor AES/EBU balanced or unbalanced inputs using the built in speaker or headphones. Meter using -18dBFS, -20dBFS, PPM or VU scale with stereo phase meter. Analyse AES sample rate, status and data errors. Generate steady tone, tone sweep, GLITS, EBU, left only, right only, on both analogue and AES/EBU outputs. Tone frequency may be adjusted in third octave steps. Adjust Tone level from +10 to -60dBu in 1dB steps. Use the built in microphone to talk to analogue or AES/EBU outputs. Generate pink noise and send to left/right/both outputs in both analogue and AES/EBU with a choice of levels in 1dB steps from +10dBu to -60dBu. 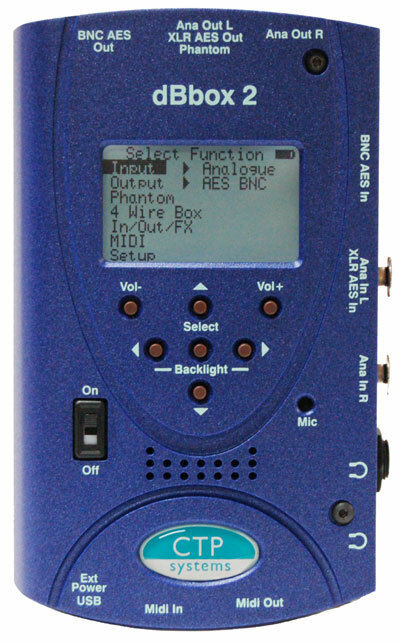 Use the built in microphone to talk to AES outputs with a choice of levels and with a built in limiter. Send an external mic to analogue and AES outputs with gain adjust and phantom power. Phantom power test with voltage read out. Also useful for checking 2 wire talkback power and channel. MIDI receiver identifying channel, note on/off and note number. MIDI transmitter with a choice of note, channel and velocity, note on and note off. Analyse incoming MIDI signals with pass through. Use the dBbox2 as an analogue to digital or a digital to analogue converter with adjustable gain in 1dB steps, a limiter and HF, LF and Mid range equalisation. 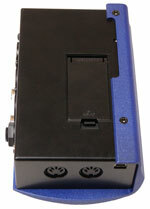 Mono or stereo microphone amplifier with 48v phantom power and analogue, AES/EBU or SPDIF output. Also with adjustable gain in 1dB steps, a limiter and HF, LF and Mid range equalisation. Four wire box using the built in microphone and speaker or headphones. 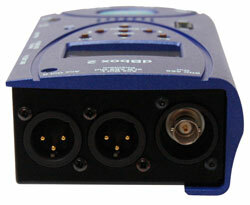 Output tone and monitor incoming audio simultaneously using Analogue or AES inputs and outputs. Particularly useful for frequency response and performance tests. Intelligent power control to extend battery life. The dBbox2 automatically switches off all electronics not required for the current task. A dynamic battery level indicator shows if you have enough battery power for a selected function. The architecture of the dBbox2 is based around a powerful digital signal processor and a separate microcontroller allowing us to add many more features in the future with just a firmware download from our website. For the future we are also working on software to allow the dBbox2 to be used as a 'test hub' allowing it to be controlled by both PC and Mac software with test sequences and results available on the computer screen. The SPDIF functions are available on the input and output BNC connectors. We can supply compact adaptors to convert to phonos if required. The dBbox2 takes a PP3 size battery, alkaline battery highly recommended. Battery life is around 8 hours continuous but very much depends on the function selected. With phantom power selected, a fair bit less! We also offer a soft case for the unit and a universal mains adaptor.